Proper nutrition is the cornerstone for an active and healthy Vizsla and good dietary management has a profound positive impact for your pal in the long run. Dog food manufacturers spend millions of dollars in research and development to ensure they deliver superior dog food formulas. Breeders and trainers on the other hand believe in the formulation of homemade dog food using meat and other natural raw ingredients. However, unless you enjoy putting in the time and effort to prepare your dog's meals, feeding your Vizsla homemade food has no advantages over feeding a high-quality commercial dog food. But, finding a high-quality and nutritionally balanced premium commercial diet can prove to be challenging at first, but not impossible! In this article you’ll find a good selection of some excellent dog food formulas, all of which your Vizsla bundle of joy will devour, so let’s take a look! **Clicking the links above will take you to the product page, where you can see prices, customer reviews, product specs, etc. Below we take a detailed look at the nutritional value in each of these foods and also discuss the diet of a Vizsla and feeding guide. 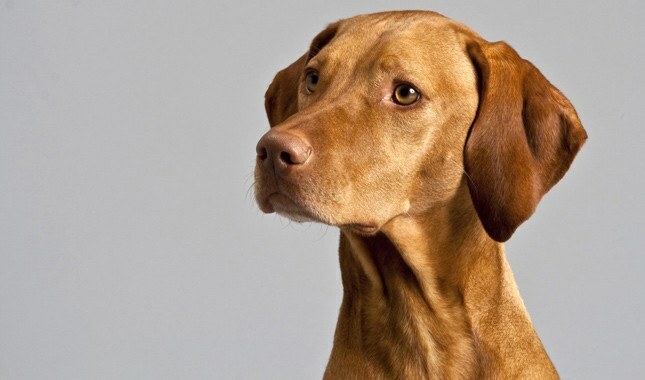 Vizslas are a medium-sized dog breed kept as household pets and as hunting dogs. This breed is active and muscular, perfect for families with children and active singles. Vizslas have short but thick and silky coats that are fairly easy to groom and range from golden to rusty in hue. This breed is gentle, affectionate, and friendly. They often become very attached to and protective of their owners. Vizslas are a quiet breed that is easy to train since they love to please their master. This quick video does a great job of providing you with a quick overview on the Vizsla breed if you'd like to learn more. As Vizslas are built for endurance and stamina it is important to provide them with a diet packed full with nutrients. There is a positive correlation between diet and a healthy Vizsla, the more quality foods you feed your dog their health increases. As a breed they do well on a raw diet and equally on high-grade dry dog food with meat listed as its main ingredient, preferably chicken, lamb, venison or, turkey. All lean meats. You can also use a mix of those. Age, weight and activity levels are some of the factors that dictate the food requirements of your Vizsla. First you need to establish the appropriate amount to provide, feed an accurately measured portion at regular intervals to help preserve their optimal weight. What food to feed your Vizsla? Given their tall frame and love for physical exercise they do best on a high-protein diet given the high amounts of calories they burn off. Good brands to feed your Vizsla include Canidae, Merrick, Orijen, Blue Buffalo or Evo – these are all brands with very little grain if any and other cheap fillers. Some owners prefer to feed them a raw diet, others prefer to feed them a mix of both. Ensure that food and water bowls are sturdy enough not to tip over easily. Ensure you supply your Vizsla with plenty of fresh and clean water and to maintain good hygienic standard clean your dog’s bowl well, after each feeding. How much to feed your Vizsla? For your Vizsla puppy feed them food that is the healthiest and least processed and is designed for puppies. Shop for quality and not price when it comes to choosing the right puppy food for your growing Vizsla. Feed them appropriate amounts of food two or three times per day and leaving their food down for around 10-15 minutes at a time to eat as much as they want to at which stage you can remove it and keep it for next time. For adults they will require three to four cups of a high-quality dog food a day. These should be apportioned and fed to them twice a day. For a happy and older Vizsla and to complement their slowing metabolism aim for a high-quality diet that is specially formulated for senior or older dogs but sticking to the same brand you have used as adults. Whilst portion size does not reduce from adult size, their foods need to contain more fiber and less fat to ensure healthier bowel function. In order to keep their Vizslas in great health, owners should feed them high quality food with a lot of nutrients to support this breed’s high energy levels. Vizslas do well on a raw diet whose first ingredient should be meat, especially chicken or lamb. Since Vizslas tend to suffer from eye and stomach problems, dog foods that are designed to tackle these issues is a plus. Taste of the Wild (TOTW) dog food is a high-quality brand and our own pups thrive on it. There aren't a lot of negative comments when it comes to TOTW and even some of the bigger brands can't make this claim. Nevertheless the manufacturers behind this brand consistently produce healthy and balanced foods and this formula is no differed. 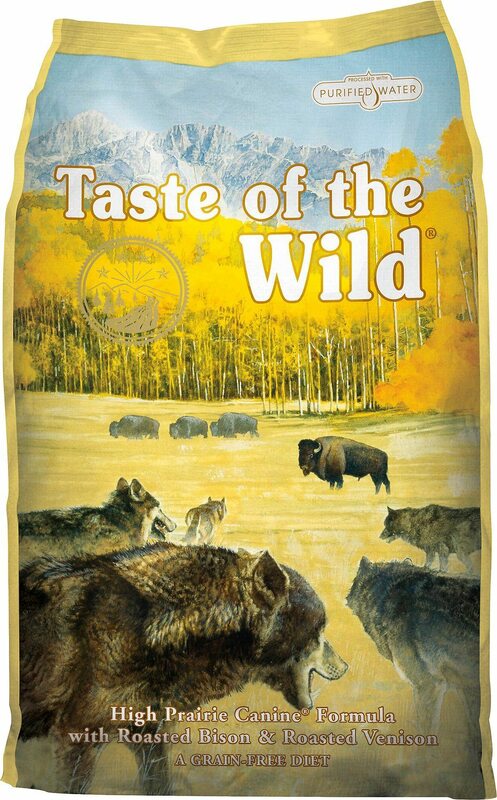 Taste of the Wild Dry Dog Food, High Prairie Canine Formula with Roasted Bison and Venison is very popular with dogs. We particularly like that it includes so many different quality animal meats that you wouldn't find in many other dog foods, like bison and venison. These are excellent and quality proteins that our pups love and dogs need. And the added health-boosting fruits and veggies knock this food out of the park. A quick look at their nutritional value show this food contains high protein and fiber content, moderate fat content and a great amount of Omega fatty acids and other vitamins and minerals for overall health. The only negative is that it is a pricier formula compared to other dog food brands. Saying that, when compared to other pricier brands with similar comparable ingredients, we really can’t find much to complain about. This may not be what you would consider budget dog food but if you can afford to splurge a little bit more on quality dog food that is precisely balanced with your dog's specific needs in mind, we highly recommend it for your Vizsla dog. No grain, corn, wheat, filler, artificial flavors, colors or preservatives. We consider TOTW a mid-priced food, but its use of quality ingredients is well-worth the investment for your Vizsla. This USA made food has 370 kcal/cup. Canidae All Life Stages dry dog food is another winning choice for your furry child, because you can feed it to dogs of all sizes and ages, from puppies to older dogs. This is the perfect solution for owners who also have multiple dogs and want to buy them high quality kibble without paying for different food for each pet. This dry dog food formula also contains no corn, wheat, or soy that can cause allergic reactions in some dogs. 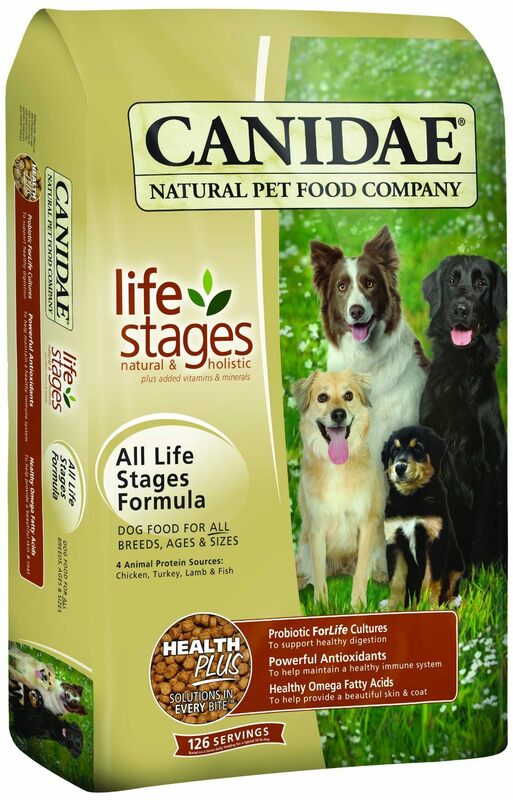 CANIDAE All Life Stages Multi-Protein Formula Dry Dog Food uses four sources of animal protein in their dry dog food: chicken, turkey, lamb, and fish. The recipe includes probiotics to support healthy digestion, which is sometimes a concern for the Vizsla breed. It also includes Omega 3 and 6 fatty acids to give pets healthy skin. Antioxidants are added to ensure dogs who eat it have a healthy immune system. No corn, no wheat, no soy. This food has 468 kcal/cup. Merrick Grain Free Recipe Dry Dog Food is made with real chicken and sweet potato, both wholesome ingredients that dogs love. The company proudly states that 70% of their recipe consists of poultry and fish ingredients, while the other 30% is made up of produce, vitamins, and minerals. This high protein dog food source has nutrients needed to support a Vizsla’s active lifestyle, whether they are an integral family member or at your side during hunt season. First five ingredients are: Deboned Chicken, Chicken Meal, Turkey Meal, Sweet Potatoes and Peas. This dry dog food recipe uses Omega 3 and 6 fatty acids to support dogs’ coat and skin health, along with glucosamine for healthy joints and bones. 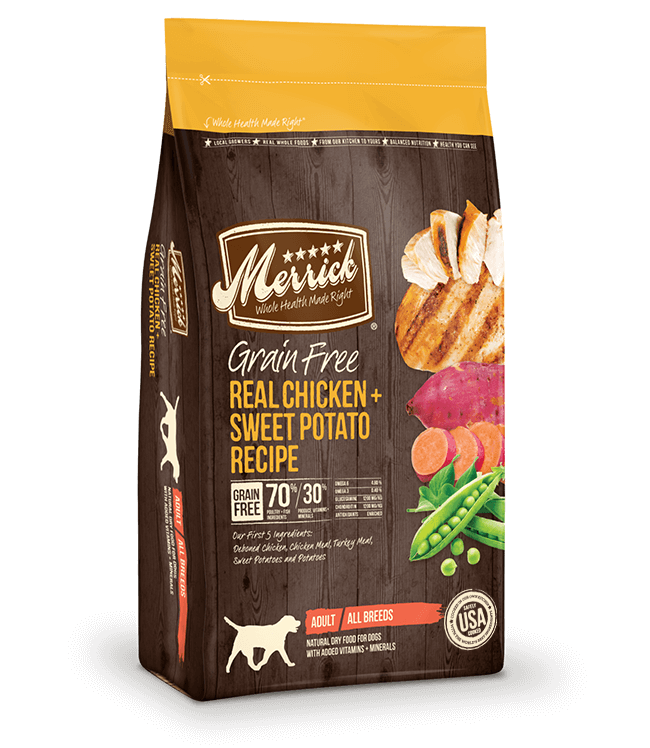 Merrick is an American made dog food brand whose first ingredient is chicken, so owners can feel confident feeding it to their dogs. This kibble is grain-free, and doesn’t contain any corn, wheat, gluten, or soy. Pet owners like this brand for its American sourced ingredients and the fact that their dog food is free from harmful fillers and by-products found in foods produced elsewhere. Owners say that this dog food gives their pets healthy coats and digestion, and is perfect for supporting larger breeds who need a lot of nutrients to support their energy levels. Some owners have noticed that dogs with a lot of allergies and sensitivities react well to this brand. This food has 402 kcal/cup. Free from corn, wheat, soy and is Gluten and Grain-Free. A 12-pound bag from Chewy is $37.88 or $35.99 with autoship. 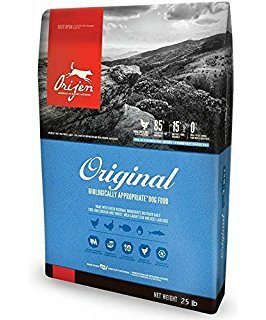 ﻿﻿Orijen Grain-Free Original Dry Dog Food ﻿﻿is a high protein, low carb option to give dogs the best health possible. The ingredients in this recipe include a variety of fresh meats, fruits, and vegetables, and no plant oils. With a minimum of 70% protein in this kibble, owners can expect that this high quality dog food will keep up with their Vizsla’s activity levels. Orijen is proudly made in Canada from responsibly sourced ingredients that pet owners love and trust. This recipe uses edible bone as a source of calcium, phosphorus, glucosamine, and chondroitin for joint and bone health without adding any artificial ingredients. The goal of this dry dog food is to provide pets with the type of food nature meant for them to eat, and it is great for dogs of all breeds, ages and sizes. Orijen’s sustainably farmed ingredients are delivered fresh daily, making them one of the highest quality pet food producers out there. Owners have noticed that picky dogs love Orijen Original Dog, and that dogs with sensitive digestion do well with this formula. Dogs who suffer with arthritis and weight issues have seen great improvements with this grain-free recipe since it is low in carbohydrates and the veggies used are low-glycemin. Owners love how their pets are so energetic after switching to this dog food, and how shiny their coats are. Orijen is a trusted brand with ingredients that owners love, which is why so many choose to feed their furry friends this food. Given their high risk of developing ﻿hip dysplasia﻿ it is vital that you don’t over feed your Vizsla causing them to gain weight. This adds pressure on their joints leading to joint problems and arthritis. To ensure your Vizsla does not ﻿be﻿﻿come ﻿﻿obes﻿﻿e﻿, a quick check is to keep an eye on their mid-section, you should be able to feel their ribs and see a pronounced waistline. If not, cut back on their food intake and employ a consistent and rigorous exercise program. To avoid bloating and swelling or twisting of the stomach avoid feed your Vizsla right after physical activity. Allow at least one hour before feeding. A note of caution if your Vizsla’s activity level is more sedentary as opposed to fully active reduce their caloric intake by 35 – 40% so that you can avoid undesirable weight gain in your Vizsla. Finally, have plenty of water available that is easily accessible especially for dogs with joint problems, poor eyesight and kidney issues or diabetes. Vizslas are beautiful, active dogs that make a great addition to almost any household that has the space to keep them occupied and happy. To keep their Vizslas healthy, owners should feed them high quality dry dog food that is high in protein and packed with nutrients. Some of the top customer and vet recommended dog food brands out there are Canidae, Merrick, and Orijen. All of these dry dog food brands feature recipes that are grain-free, with responsibly sourced ingredients that are meant to optimize dogs’ health and keep pets happy for years to come.